There aren’t many European presidents who’d quote Marxist economists or praise Fidel Castro. 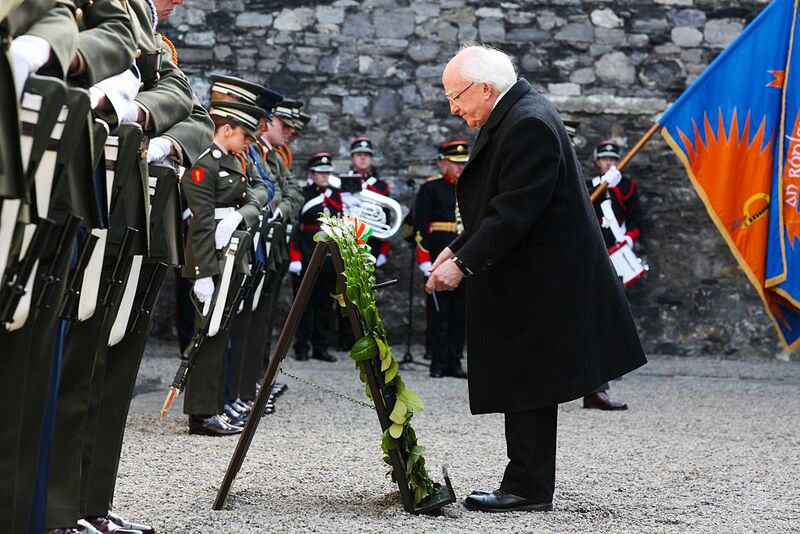 But Ireland’s Michael D. Higgins is widely backed across the political spectrum. On October 26 Ireland goes to the polls to elect its president. Even in a crowded field of six candidates, it looks almost certain that President Michael D. Higgins, a socialist who spent most of his life on the left-wing fringes of Irish politics, is going to win a second seven-year term. Higgins is renowned for his activist record and his sharp critiques of neoliberalism. Even as president he has cited thinkers like Ernst Bloch and David Harvey. But if in Friday’s election the socialist Higgins will surely defeat the ragbag of reality-TV entrepreneurs standing against him, this will have little effect on the broader political climate. Higgins is something of an anomaly. His likely reelection comes despite the collapse in support for the Irish Labour Party, of which he was a member for over forty years, and the otherwise poor electoral performance of the Irish left. If Higgins himself can be compared to Jeremy Corbyn or Bernie Sanders, his popularity has not brought electoral success for wider progressive politics. This largely owes to the weakness of the presidency itself. The Irish state emerged from the failure of the Irish independence movement. The heroic but doomed 1916 rising had promised a secular republic that would secure “the ownership of Ireland” to the people of Ireland and cherish the “all the children of the nation equally.” Yet what ultimately emerged after partition and civil war was a Catholic state that simply inherited or replicated the state structures of the United Kingdom. Some of this is embarrassing. For example, to work as a barrister in Ireland you must qualify at the “King’s Inns,” despite the fact that, as a republic, we have no king. But some of it is less objectionable. The system of government replicates closely the UK system where the Dáil stands for the House of Commons, the Seanad for the House of Lords, and the president for the monarch. The president of Ireland is therefore very unlike the president of the United States or the president of France, and much more like the British Queen. They serve really two main functions. Firstly, they hold very limited discretionary powers which allow the president to act as a check on the power of parliament. These limited powers are rarely used. The Constitution moreover states that the president’s “powers and functions [are] exercisable and performable by him only on the advice of the Government.” In other words, the president can only act in line with government policy. This leaves the second function of the president, what the president spends nearly all their time doing: they serve as a ceremonial head of state. Essentially, they meet people, launch things, and give talks. This does not mean that the position does not matter. Although ceremonial, its unusual character as being “above politics” allows people to express themselves politically in a way different to how they might normally. Perhaps the most important moment in Irish presidential history was the election of Mary Robinson in 1990. Robinson had previously been a prominent feminist lawyer, academic, and social activist. She was only the second person to run without the nomination of one of the two major center-right parties that have dominated Irish politics since independence, and the first to be elected. As a left-wing outsider, her victory was highly unexpected. It marked the beginning of the end of the power of the Catholic Church in Ireland and the move towards a more secular republic. But, Robinson was not Ireland’s last surprisingly left-wing president. For 2011 saw the election of Michael D. Higgins. Michael D. Higgins is something like the Bernie Sanders or Jeremy Corbyn of Ireland. Throughout his political career he has been a vocal socialist and one of the only mainstream politicians who would come out for almost every left-wing cause, be it housing in the 1960s, activism alongside Mary Robinson and other feminists in the 1970s, anti–apartheid activism in the 1980s, or antiwar activism in the 1990s and 2000s. He has been one of the best-known parliamentarians in Ireland for decades, even having a country rock song written about him. For a long time the voice of the left wing of the Irish Labour Party, he was twice mayor of Galway, and in the mid-1990s he was a transformative minister for Arts, Culture and the Gaeltacht (Irish-speaking areas), setting up both the Irish Film Board and TG4, the Irish-language television station. He is surely one of the only heads of state who would draw on David Harvey, André Orléan, Ernst Bloch, Philip Mirowski, Michel Foucault, Ruth Levitas, William Morris, and Roberto Unger (among others) in a single speech ostensibly on economic governance. We are in such a winter as Weber foretold. For example, we have arrived at quite widespread acceptance by policy makers . . . that markets are rational. This, on occasion, leads, in the extreme, to the suggestion, absurd and all as it may sound, that it is people who are irrational, the markets rational. That public, for whom, Friedrich von Hayek wrote that economics are too complex, it is suggested, require something other than the direction of elected governments. They must be forced into a compliance with technocratic demands, for which there is frequently scant scholarly support and, needless to say, no mandate. This represents a challenge to democracy itself I suggest and to the scholarship that supports it. This critique of neoliberalism has not gone down well with everyone. Jonathan Chait, Matt Bruenig, Mike Konczal and others in America have debated whether neoliberalism is a meaningful term. But if in the United States the discussion is about socialist journalists’ use of the term, in Ireland aggrieved liberals are complaining about the president himself. President Higgins has also called for a revival of utopian thinking. But, “following Ernst Bloch” he argues “utopian alternatives must be accompanied by a praxis … [U]topianism not only involves a rejection of what is, and a hope for an alternative, but also a strategy for its implementation.” Ernst Bloch was a German Marxist philosopher who worked on utopian theory, insisting that the imagining of abstract utopia today should be matched with the imagining of concrete utopia. A concrete utopia is one that is “concerned to deliver the forms and contents which have already developed in the womb of present society.” For Bloch this meant the practical work of the construction of socialism in the contemporary world. All questions of practical politics, much less the construction of socialism, are outside the remit of the Irish presidency. It is perhaps this position, above the fray of politics, outside the difficult implications of decision making, that has allowed Higgins to increase in popularity while the party of which he was long a member has dwindled into insignificance. In the 2011 general election, the same year Higgins was last elected president, the Irish Labour Party won thirty-seven seats, in the best performance for any left-wing party since independence. This launched Labour into a coalition government, which implemented a harsh austerity program. Today, it has only seven seats, the minimum to get party speaking rights in the parliament. It is highly likely they will perform even worse in the next election. In the seven years since Higgins’s election, there have been numerous mass popular movements. Particularly important have been the struggle against austerity, against the introduction of a water tax, and the struggle to legalize abortion. Although the president is constitutionally prevented from acting against the advice of the government, some socialists and activists have criticized Higgins for signing into law the austerity policies of the last government. Electorally, the Labour Party’s decline has been matched with the success of Sinn Féin and of small socialist parties and independent socialists. The result has been a highly fragmented left, with a large number of unaligned socialists: indeed, no fewer than eight nominally socialist parties won seats in the 2014 local elections. And since then one of these parties has split. Most of these small forces have not endorsed Higgins’s 2018 campaign for president. Despite making commitments during the 2011 campaign that he would only stand for one term, this July President Higgins announced his intention to run for a second term in office. Historically, when a president wished to run again they were allowed to do so without contest. The only other time that an incumbent president had to fight an election was in 1966, when the increasingly blind eighty-three-year old president, Eamon de Valera, was challenged largely on the basis that he was too old for another seven years in office. But even then, de Valera refused to campaign, and the national broadcast media refused to cover his opponent, who was defeated. This time round however, not only is Higgins being challenged, but there are five candidates running against him. This is especially remarkable given the obstacles to standing. A candidate has to be nominated by either twenty of Ireland’s 218 parliamentarians or four of Ireland’s thirty-one city and county councils. Prior to 1997 no presidential candidate had ever received a nomination via the city and county council route. But once that gate was opened Ireland’s local councillors have clamored to have a role in the process, even nominating candidates they do not support. Apart from Michael D. Higgins, there are two candidates who appear to be running for reasonably respectable reasons and three who appear to be motivated largely by vanity. Firstly, there is the soft-left contender Liadh Ní Riada, the only candidate to have received their nomination via the nominations from parliamentarians. A member of Sinn Féin, Ní Riada is a member of the European Parliament for Munster (the southwest of Ireland) and a long-time promoter of the Irish language. As a left-wing, republican, Irish-language speaker, and enthusiast for the arts, she is in many ways similar to Michael D. Higgins. Yet the incumbent president is in fact substantially to her left, and far more a veteran of activist politics. A further difference is that, despite being a candidate for a deeply republican party, she has said that she would wear the Royal British Legion’s Remembrance Poppy, which is widely seen in Ireland as a symbol of British imperialism. The second respectable candidate is Joan Freeman who represents a rather different Ireland to Higgins. She is devoutly Catholic and so represents a more conservative base. Some of her work represents the better aspects of the Catholic church’s interventions in Irish social life. She was the founder of Pieta House, a suicide intervention charity that runs several centers where people can go when they feel suicidal. Despite its Catholic foundations, even committed socialists and anarchists have done fundraising for this praiseworthy charity. However, many of her interventions are troubling. She has claimed that divine intervention cured her of eczema. She voted against legalizing abortion in any circumstance. And she has strong family links with some of the most extreme elements of Catholic conservativism. One such “Dragon”; Sean Gallagher, is polling in second place behind Higgins. He is a former member of the center-right Fianna Fáil party, which dominated Irish politics between 1932 and 2011, and he also ran in the last contest. He was at one point the front runner in this 2011 presidential election, but was felled by questions over whether he had accepted a bribe on behalf of Fianna Fáil, a party marked by strong corruption in the 1980s and 1990s. A tweet from a fake account regarding this controversy was read out during one of the 2011 presidential debates, leading to Gallagher collapsing in the polls. Due to the unclear provenance of this tweet, Gallagher sued the broadcaster for libel. His motivation for running again seems to be rooted in resentment and a belief that he is somehow owed the presidency because it was unfair for this tweet to be read out on air. Over the intervening seven years Gallagher has been largely absent from public life. And his sixty-second pitch on why he wants to be president was widely seen as bizarre: more than anything reminiscent of Kang/Bill Clinton’s “twirling towards freedom” speech in The Simpsons. The motivation for fellow “Dragon” Gavin Duffy is equally unclear. He runs a media consultancy that, among other things, provides media training for politicians, which makes his consistently terrible media campaign all the more humorous. Early in campaign he had a car crash of a radio interview, which began with him saying his name wasn’t actually Gavin Duffy but was rather Liam Duffy — he changed it to Gavin because he thought it was cooler. Unprompted, he then spent the next few minutes talking at length about the disturbingly large number of car crashes he has caused. He clarified though that his “boy racer” days — and indeed habit of falling asleep at the wheel — are “long behind” him because now he has a chauffeur. Aside from such blunders, Duffy appears somewhat unclear about what the role of president entails. On the main television debate on October 24, three days before the nation goes to the polls, he said he wants to launch something like an Irish equivalent of the US Peace Corps, although he appeared unclear what powers the presidency would have to do such a thing. The final reality TV millionaire candidate, Peter Casey, is by far the worst. In all polls he has been stuck at the bottom of the pile barely scrapping 1 or 2 percent. But he stumbled upon that one quick trick to get the liberal media to become fascinated in you and in the process massively boost your profile: racism and bigotry. In an interview with the Irish Independent newspaper Casey abruptly set off on a racist rant against Irish Travelers. He knew what he was doing, here. A small and deprived nomadic people indigenous to Ireland, travelers are subject to severe racism and prejudice. For example, a number of years ago a transparently guilty man was acquitted of a brutal murder, apparently simply because his victim was a Traveler. Casey has tried to exploit this dark side of Irish society for his own electoral gain. Happily the response from most quarters has been a surprisingly robust rejection of Casey’s racism with many calls for him to drop out of the contest. Casey then suggested he would heed that advice, only to come back a few days later saying he would not leave the race. Instead he said he would now be campaigning on his belief that Ireland is a “welfare-dependent state.” In Tuesday’s debate Casey joked that if elected president he would be the most “exciting” president. Racism and bigotry: how exciting! We can only hope that after the campaign, Casey slides back under whatever rock he crawled out from. Fortunately, it is almost certain that Higgins will win. All polls put him receiving 65-70 percent of the vote. Gallagher is next at 11-15 percent, then Ní Riada at 5-11 percent. All the others are in single figures, though Casey may indeed succeed in tapping into a vein of bigotry. Higgins’s polling lead may well not translate into such a crushing majority; turnout is likely to be very low and it is many Higgins voters won’t bother voting if they assume he will win anyway. Yet his victory seems secure. Such high poll scores are in any case remarkable for a president who uses his position to denounce neoliberalism, praise Castro, and call for a strategy for the implementation of Ernst Bloch’s utopias. Much of his support comes from centrist and even center-right voters who are not bothered by having a socialist president who talks dreamily from a position with little to no power. But it is worth noting the disparity between Michael D. Higgins’s 70 percent support and recent polls for the next general election (due by 2021) which put his former party Labour on 5-6 percent. Aside from Sinn Féin, all other socialist parties are performing even worse, polling at 2 percent or lower. Sinn Féin are polling 15-25 percent for that future contest, higher than their presidential candidate Liadh Ní Riada . This disparity between the popularity of Higgins and the popularity of any existing left party is remarkable. Perhaps Irish people like abstract critiques of neoliberalism and socialist speeches on the questions of ethics and the economy more than they like practical socialist politics. Or perhaps there is a greater appetite for left-wing ideas in Ireland than is generally thought. Oisín Gilmore is a PhD candidate in economic history at the economics, econometrics, and finance department at the University of Groningen in the Netherlands. He is currently a visiting researcher at Trinity College in Dublin, Ireland.